Easter greetings to all! As the Easter celebration draws closer, ICM is pleased to announce the next event tagged: “EGGTRAVEGANZA 2015”, which will kick off from 29th March to 5th April, 2015. · THE EASTER BUNNY PROMO: From 29th March to 3rd April 2015, shoppers are encouraged to purchase any item up to the tune of N5,000 or more in any store in ICM, and then drop receipts with contact details at the designated boxes placed at the 3 entrances into the mall. There will be a raffle on 3rd April and 6 winners will be selected and contacted. Winners will win gifts donated by participating tenants. They include Mr.Price, Cold Stone, Mr.Price, Mango, Bheerhugz Cafe, Sports World, Enzzo, Jack & Jones, Wrangler, KFC, Nike, Swatch, Da Viva, black|Up, Bruno's Place, Seven Eagle Spur Restaurant, Shoprite, V Shop, and much more. · EASTER BUNNY TREASURE TRAIL: On Easter Sunday, there will be a treasure hunt and shoppers will search for clues on twitter, Facebook and this blog for clues about participating tenant stores to locate the treasure (Easter eggs). 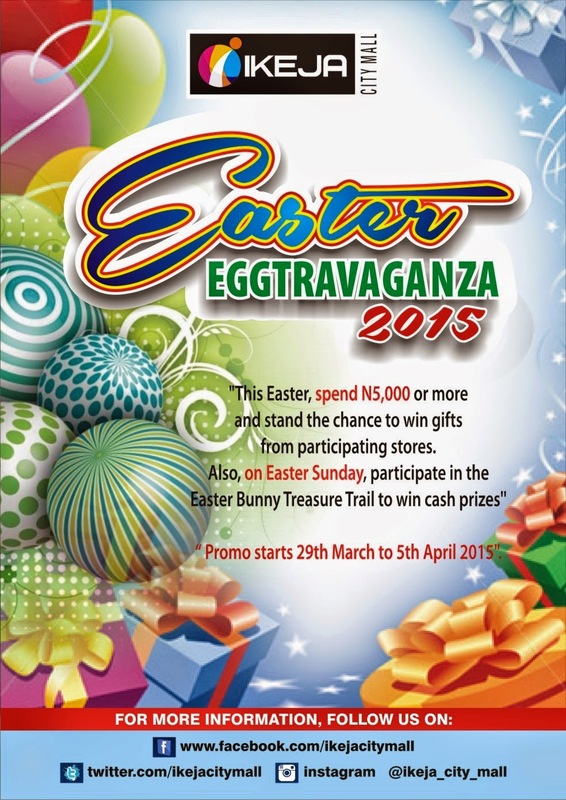 If you shopped up to the tune of N5,000 on Easter Sunday, you qualify to participate for the Easter Bunny Treasure Trail. Each shopper that discovers an egg will win N10,000 to spend in any of the participating stores in ICM. 10 winners will emerge from the Easter Bunny Treasure Trail. Please note: Only those that purchase up to the tune of N5,000 in ICM will participate in the Treasure Trail. · EASTER BUNNY LUCKY WALK: On Good Friday, Easter Sunday and Easter Monday, the ICM Bunny will walk around the mall giving shoppers Easter gifts at its own discretion in appreciation to shoppers for their patronage. So why don't you make ICM the place you do all your Easter shopping this season? You stand the chance to be one of the 16 lucky winners. Also, don't forget to be on the lookout for clues on this platform. Good Luck! Happy Easter Celebrations in advance! As always, Ikeja City Mall remains your choice destination for leisure, shopping and entertainment!